Wow, I haven't played a game like this since the original Sim City way back in the '90s on my friend's Macintosh computer. That game was... hold on a sec, did I just say "way back in the '90s"? Holy crap I'm getting old. Ah, sorry, okay back to the review. As I was saying, that game was cool... for all of about 3 hours when we realized how boring it actually was. Well, Tycoon City- New York is the latest in that style of games, so I was excited to get a chance to revisit the genre and check out how things have changed. Nowadays it seems that they're all fancified with 3D graphics and they make use of that upgraded processing power by giving you the opportunity to zoom in on each individual creature... er, I mean person. My initial thoughts: hey, this is pretty cool. Three hours later: is there any way to make a meteor wipe out my city? Hurricane? Alien invasion? Yep, after a while fixing up buildings and watching the money counter increase just gets boring and tedious. Initially, though, the game does start out as an enjoyable experience. You're first taken though a very short and over simplistic tutorial on how to play, though this didn't really help out very much, because once I actually started the game I was almost instantly confused. How do I build a building? I just kept clicking on the litter icons around the screen 'till I found one that seemed to let me place a building. I was able to repeat that a few times, and then figured part of my confusion was due to me failing to realize that you can't just build any type of building anywhere you want. Once I accepted that, I went and started buying up other people's buildings. It wasn't long before I realized that I needed to fix-up some of these places to keep people happy, you know, to keep the money flowing in. So I planted a tree here, bushes there, hung a neon sign on this building, put 20 air conditioners on that building, and then whatever else that needed to be done in order to keep my maggots, er, people happy. The thing about doing this is, it's easy. Too easy. I remember back in Sim City where it got to be quite a challenge keeping everybody happy, but this game practical tells you exactly what you need to do, so there's little challenge. And even when you fail, you don't really fail, you just don't do as well as your competitors. And it's also at about this point that the "okay, what else is there to do" feeling starts to creep inside your brain. Oh, hey, if you build up enough money and reputation they you can franchises! Yeah, wow, big-whoop. I'd rather go back to playing King Kong. But hey, at least the graphics are really good, especially considering you can zoom from a sky-view of the city to up-close-and-personal with your ants, er, people. Also, I didn't notice any kind of slow down or skipping, though that may just be dependent on how well your system is configured. So overall, if this game is typical of how these games have evolved, then I'm not impressed. But then again, those were never really my type of games in the first place. 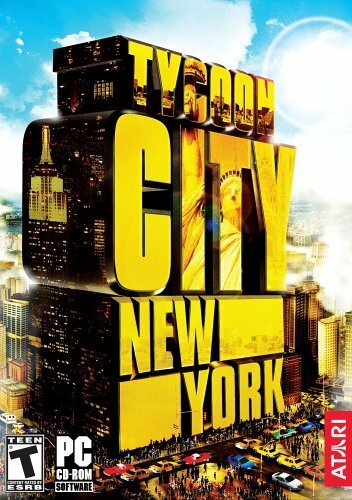 Tycoon City: New York was released by Atari on March 10, 2005. Click here to visit the official Tycoon City: New York website. Soon I will be receiving a copy of Tycoon City: New York for review, but since videogames take so much longer to review than DVDs and movies, I've put up this preview of the title until I can get actually get the game and review it. This way you can check it out a little beforehand. So the following all comes from Atari. Once I get the game and play it through, I'll come back here and replace all this with my review. New York City comes alive in Tycoon City: New York, the first and only Tycoon game that simulates a real-world city and gives players the ability to create and customize over 100 types of major businesses. Finally, it’s your chance to make it big in the Big Apple, taking on a number of roles as you build your reputation as a Tycoon. Players can choose to run a hot nightclub, oversee a media conglomerate, open a lucrative Broadway theater - the choices are endless. Featuring stunning 3D graphics, Tycoon City: New York is the ultimate Tycoon game. The player strives to reach Tycoon status by building and operating a variety of exciting businesses and events, from restaurants and fashion shops to theatres and night clubs, aspiring to provide spectacular events such as huge rock concerts in Central Park and New Year’s Eve Celebrations in Times Square. As the player progresses, he or she is rewarded by unlocking many of the iconic monuments of New York City, including the Statue of Liberty and Empire State Building. Erect the Statue of Liberty, Empire State Building and other world-famous New York landmarks. Click here to visit the official Tycoon City: New York website.